Conformal coating removal is used for stripping conformal coatings and solder resists from printed circuit boards. The conformal stripping process is performed using a range of solvents and involves brushing or swabbing the area with solvent until the conformal coating is removed. Plasma Ruggedized Solutions offers a variety of solutions for the removal/stripping of conformal coatings. We use several different methods, allowing us to choose the process that best fits the application. Chemical stripping can be challenging due to conformal coating chemical resistance and moisture resistance, but with the right solvent and process, effective conformal coating stripping can be achieved. We offer solvent, physical, and plasma removal and stripping services and various cleaning methodologies for PCB. The safety of the components being stripped is of utmost importance. To help reduce risk while still achieving effective conformal coating stripping, we always use the mildest chemistries and processes possible. Contact us today to learn more about conformal coating removal. Conformal coatings protect printed circuit boards from moisture, contamination and impact, but the durability of the material and conformal coating chemical resistance to solvents can make stripping difficult. Various factors are taken into consideration prior to beginning the chemical stripping process including assembly materials and the effect on solder masks and components. Plasma ruggedized Solutions uses three primary methods for conformal coating removal: solvent-based, physical and plasma. We take all factors into consideration and use our years of expertise to determine which method is best for your specific printed circuit board application. The most commonly used method for conformal coating removal is a solvent process. This process is highly effective in removing acrylic, urethane, and silicone printed circuit board coatings. Component compatibility is a key consideration in this process, and Plasma Ruggedized Solution works directly with clients to ensure that the components to be stripped will not be negatively affected by the solvents used. Based on the coating material type, we will formulate a plan to maximize the effectiveness of the removal/stripping process, while minimizing the risk to the components. Once this plan has been approved by the client, the plan is put into action. Acrylic coatings are the easiest to remove with the solvent process. Chemistries are used to strip the conformal coatings. When dealing with silicone coatings, Plasma Ruggedized Solutions utilizes mild solvents and/or specifically created chemistries to strip the coating material. This process is relatively harmless to the electronics on printed circuit boards and causes minimal risk to components. On the other hand urethane coatings are two-part coatings and can be more difficult to be removed because they have been heatcured. We typically use stronger solvents and specifically formulated chemistries to remove them. In some cases, very powerful chemicals are needed to strip urethane coatings; if so, we always consult with the client to educate them on any potential risks involved prior to performing the service. Epoxies may require the use of a physical process to remove them from coated components, because of their strong cross-links and heat cured finish. Epoxies often require physical removal of the material before the use of a solvent process to complete the removal/stripping of the conformal coating. Plasma Ruggedized Solutions’ physical removal and stripping methods are most commonly performed by hand, using selective ablation to remove the coating one small section at a time. Another alternative to removing/stripping epoxies is the micro-ablation process using a controlled particle spray to remove the Epoxy from the printed circuit board. Physical removal and stripping of conformal coatings are highly effective but do pose potential risks, such as damage to solder joints and metal surfaces, and possible electrostatic discharge. We always consult with our clients prior to performing any removal process which may pose a risk to the components involved, and we always use the most benign methods available. Plasma Ruggedized Solutions also offers plasma processes for the removal and stripping of conformal coatings. This process is ideal for high-end components which may require only selective removal of coating materials, though the entire assembly can be stripped with this process as well. Using plasma to remove conformal coatings is a highly precise, fine-scale procedure, and works extremely well for acrylics and epoxy coatings. The plasma process can also be used for cleaning fine particulates from connectors and other elements of PCBs and components. Assemblies may need to be reworked for electrical, and/or functional failures. 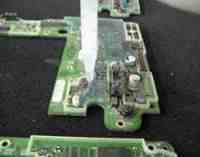 The printed circuit board is not functioning as anticipated, or it might fail after use in the field. The initial design process did not allow for the inclusion of the coating itself, and this causes problems with the component’s functionality. Existing conformal coating is of poor quality or has flux residues, and/or poor adhesion. The incorrect coating was applied the first time around, either at the client’s or another facility, and needs to be stripped to apply the conformal coated properly. No matter the reason, Plasma Ruggedized Solutions has the technology and expertise to return your components to their original, pre-coated condition. We also ensure all PCB assemblies are in functional condition prior to reapplying the conformal coating. After removing the conformal coating, we return the printed circuit board components to you for testing to ensure that they still function correctly following the stripping process. Once we receive confirmation of functionality, we recoat your assemblies following your exact specification, and with appropriate conformal coating required for the environment the assembly would be subjected to. Whether you need to make part changes, update product functionalities, or repair failed components, Plasma Ruggedized Solutions can strip and recoat your assemblies with supreme efficiency and outstanding quality. Contact Plasma Ruggedized Solutions today for additional information about the removal and stripping of conformal coatings from your products. We offer the finest, lowest impact service in the industry, and our team of experts will work with you to create the ideal process for your printed circuit board application.